Bridges to Cuba/Puentes a Cuba is a writing and web project created by Ruth Behar and Richard Blanco. I designed and developed a prototype and proof of concept for their project. This project was completed in May 2015. Here's a story of the project and my process. The first step we took was to define the goals of the project. I talked with Ruth and Richard on the phone and we discussed their inspirations for the project. Ruth's edited collection, Bridges to Cuba/Puente a Cuba, published in the 90s, was a starting point for the web project. They wanted to know where writing and dialogue stood now, in the wake of changes in the US and Cuba. Their goal was to share writing among peers and the broader public to facilitate ongoing discussions and contemplation. I also learned that family history was central to their design aesthetic, as they referenced family photographs and letters in our talk. We defined that the goals of the web project would be to have a place to post curated contributor's writing in English and Spanish, allow moderated comments, create an email list, and house all of this on a website that matched their aesthetic. After defining our goals and getting a sense of the project, I began to create the visual design and UX (user experience) of the site. I gathered materials from Ruth and Richard, such as family photos and letters. I created a custom collage from these photos and tested using this collage as the homepage. Initially, the collage had the original color of the images. I applied an all over sepia tone to the collage to create the nostalgic and historic aesthetic I thought worked well for this project. I created an overall color palette for project based on this collage. The colors included browns, muted reds, and creams. 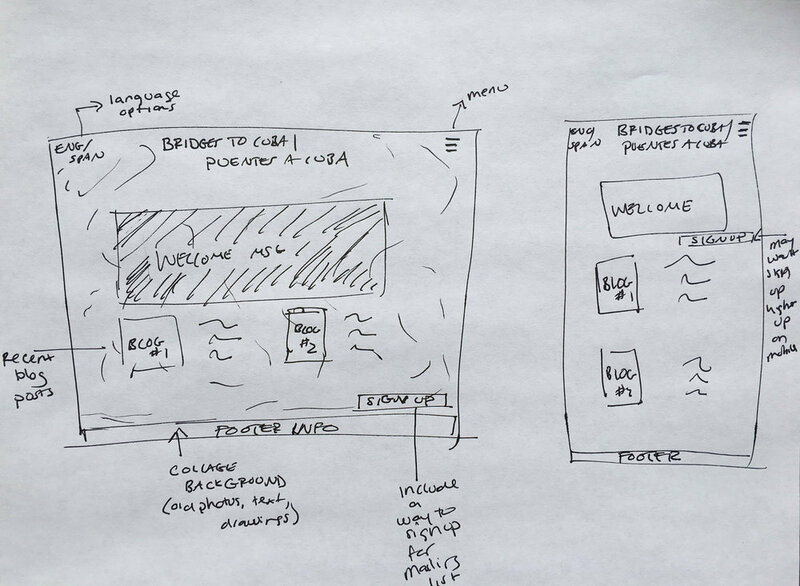 At various points in the design process, I sent iterations to Ruth and Richard for feedback. These iterations helped me to revise the design and overall UX (user experience) of the site to meet their expectations as well as those of potential users (writers and other visitors to the site). Some of the design adjustments included altering some image placement and cropping. Adjusting the color palette. Revising the flow of the page with Ruth and Richard's biographies to flow more like a story, instead of a biography page that was more similar to the Board of Advisors page. In the end, I presented a complete prototype for Bridges to Cuba/Puentes a Cuba that proved the concept of their idea for an online writing project.